This morning I found myself somewhat embarrassed to discover how little I knew about jazz pianist and composer Alexander von Schlippenbach, in spite of my avid interest in free jazz at its most adventurous. Back when I was writing for Examiner.com, I was following the work of his wife, Aki Takase, with great interest; but, since both of them are pianists, I only encountered him once on one of Takase’s recordings, So Long, Eric! Homage to Eric Dolphy. Each of them led a combo from the piano for four of Dolphy’s compositions, making my sampling of Schlippenbach’s work a highly impoverished one. Things changed for me last month when Intakt Records released Globe Unity • 50 Years. In the autumn of 1966, Schlippenbach formed the Globe Unity Orchestra with the support of a commission from the Berlin Jazz Festival. The group gave its first performance of unbridled free jazz at the Berliner Philharmonie on the following November 3. The front line consisted of Gunter Hampel (bass clarinet and flute), Willem Breuker (baritone saxophone and soprano saxophone), Manfred Schoof (trumpet), Gerd Dudek (tenor saxophone), and Peter Brötzmann (saxophones). In the rhythm section Schlippenbach was the only pianist. There were two drummers, Jaki Liebezeit and Sven-Åke Johansson, and two basses, Buschi Niebergall and Peter Kowald, the latter doubling on tuba. By way of historical context, the recording session for John Coltrane’s Ascension album took place on June 28, 1965; and, unless I am mistaken, the resulting album was released before the end of that year. It may well have inspired the Berlin Jazz Festival, although that group basically involved adding seven musicians to Coltrane’s core quartet at that time. That quartet consisted of a rhythm section of piano (McCoy Tyner), bass (Jimmy Garrison), and drums (Elvin Jones) behind Coltrane’s work on tenor saxophone. The only additional rhythm player on Ascension was a second bass, Art Davis. On the other hand, Coltrane was joined by six additional players on the front line. Those included two more tenor saxophones (Archie Shepp and Pharoah Sanders), two alto saxophones (John Tchicai and Marion Brown), and two trumpets (Freddie Hubbard and Dewey Johnson). The overall structure could be called (about as loosely as possible) a rondo form. The repeated section consisted of the entire group free-blowing on a rather simple five-note motif. Between the repetitions, each of the front line players would take a solo improvisation. The last three improvisations were taken by Tyner, Davis and Garrison as a duet, and Jones, respectively. On the basis of my own listening experiences, I feel that the number of musicians participating in a free jazz session has tended to decrease. I would like to believe that this is because, as the individual players became more adept at improvising without some supporting structure (like one of Frank Tirro’s “silent themes”) they attached more importance to listening more closely to each other. Such listening clearly benefited from working in smaller groups. On the other hand, over the course of the fifty years since the Globe Unity Orchestra was created, the group seems to have expanded its front line and reduced its rhythm section. 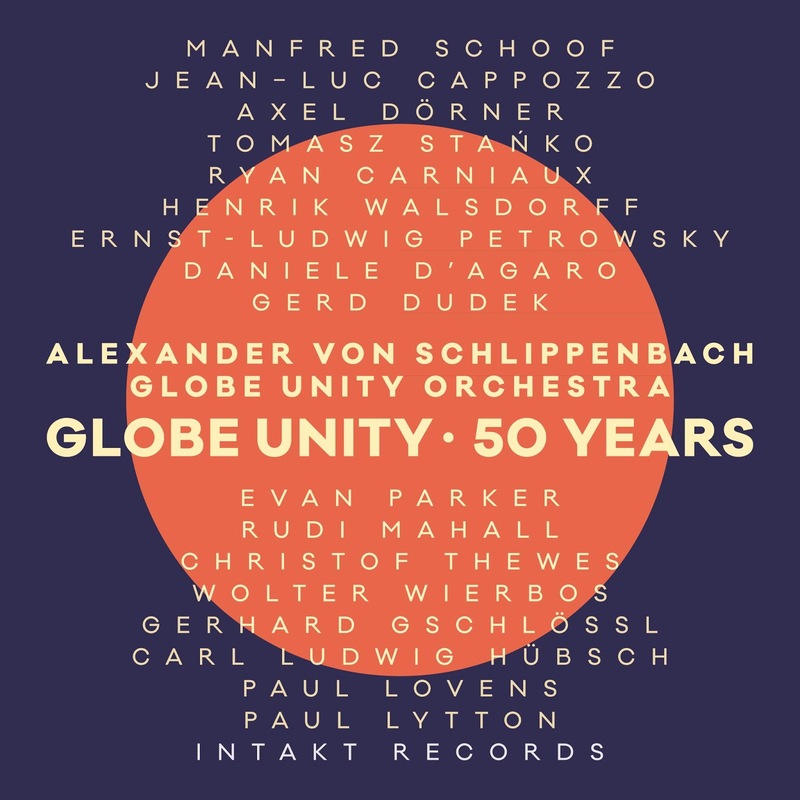 As a result, on the new Global Unity • 50 Years recording, rhythm consists only of Schlippenbach on piano and two drummers, Paul Lovens and Paul Lytton. (By way of free association, I am reminded that the San Francisco Symphony has three bassoonists all named Steve.) The front line, on the other hand, is positively symphonic: Henrik Walsdorff (alto saxophone), Ernst-Ludwig Petrowski (alto saxophone, clarinet, and flute), Daniele D’Agaro (tenor saxophone and clarinet), Dudek (soprano and tenor saxophones, clarinet, and flute), Rudi Mahall (bass clarinet), Alex Dörner (trumpet), Schoof (trumpet and flugelhorn), Jean-Luc Cappozzo (trumpet), Tomasz Stańko (trumpet), Ryan Carniaux (trumpet), Christof Thewes (trombone), Wolter Wierbos (trombone), Gerhard Gschlössl (trombone), and Carl Ludwig Hübsch (tuba). Note than Schlippenbach, Dudek, and Schoof are the only remaining “veterans” from the original Globe Unity Orchestra still playing in the group. From the listener’s point of view, the session is an episodic one. However, it does not follow the “rondo” model of “Ascension.” As a result any thoughts about how the piece unfolds as a sequence of episodes is left as an exercise for the listener. Whether or not such an exercise is necessary is also left to the judgment of the listener. Suffice it to say that the session lasts for almost 45 minutes, which makes it longer than either of the two takes for “Free Jazz” or the two takes for “Ascension.” I take this to suggest that we, as listeners, have become more and more comfortable with longer and longer durations, even when our fundamental capacities for sensemaking are significantly challenged (if not disabled) over the course of those durations!